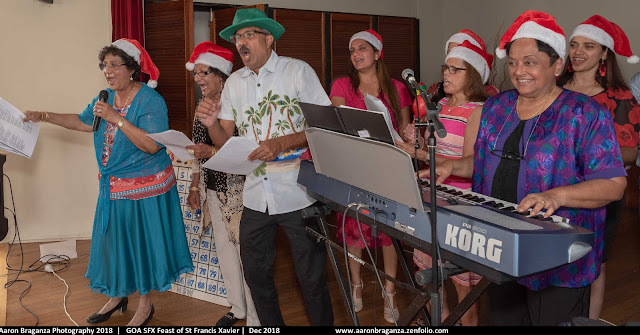 WHEN A GROUP of Goans get together to do something for the community, it is not often that they achieve the quality of excellence that was on show by the Goan Overseas Association of New South Wales in Sydney, Australia, December 2 for the celebration of the feast of St Francis Xavier. It was not perfect, but it came very close … read on. A long, long time ago, there some unforgettable SFX feast days … days when the association attracted 60 or 70 children and Santa had his hands full … when the choir singing Konkani hymns brought tears of joy to many eyes … or listening to traditional Goan songs or watching traditional Goan dances … those were the days when the senior citizens (retirees) were treated to an exclusive Goan meal, with Goan sweets to take home, drinks (Harold D’Souza usually had a bottle or two of feni for the day) served by dedicated members … all in all they were days that filled the hearts of old timers like myself with joy. Today (December 2) was very much like one of those memorable days from the past. President Alwyn Henriques and his team were applauded by most of the seniors I spoke to at the lunch. All agreed it had been a truly memorable day. 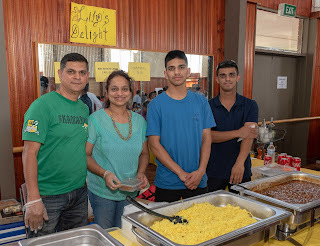 In previous years, the hall often looked like a collective of shacks but this time the hall looked pretty smart, tables neat with plastic cloths, lined with chairs in a row and catering stalls hugging the walls but not packed like sardines in a tin. The stage was also welcoming. Alwyn and his team decided very early that they and their partners would concentrate largely on the senior citizens. Olivia Vaz and Audrey Henriques were perfect hosts, helping folks to their tables, even serving the plates and bring them to some folks who needed a little help, or need their glasses filled. Joe (very dedicated Cultural secretary and the man in charge of the day) and his wife Alcina were never too far away. So was Agnes D’Souza. The drinks waiters were: Wendell Drego, Diogo Fernandes and Alwyn, of course, was lending a hand wherever possible. Ralph and Olivia, and Abel do Rosario are visibly the hardest working people around. Abel unfortunately was not able to attend due good family commitments. Of course, Aaron Braganza, who continues to grow as a photographer, was doing sterling work. My personal view: After a long time I think we actually saw the committee members at work … as opposed to the armchair managers we have sometimes seen in the past. Really proud of the committee and their partners. Congratulations must also go to the Goan chef, Leera Sequeira, who provided the excellent Sorpotel (made by Leera’s sister Lata Britto), pullao, chicken curry, potato chops, veg and the iron salad as well as the Goan sweets (Joe and Alcina included one or two things they brought back from Goa on their last visit. other sweets were donated by their friends) . There were several food stalls doing brisk business for members and guests, easily numbering 300 or more. Since I was complimentary meal, I was not able to report on the fare on offer, however, my friend Mervyn Pinto was quick to offer me a pao with Goa sausages … it was delicious. Mervyn is making a bit of name for this his regular fare, as well as his sausages. There were other folks doing similar things. I guess I will write about them the next time we meet. 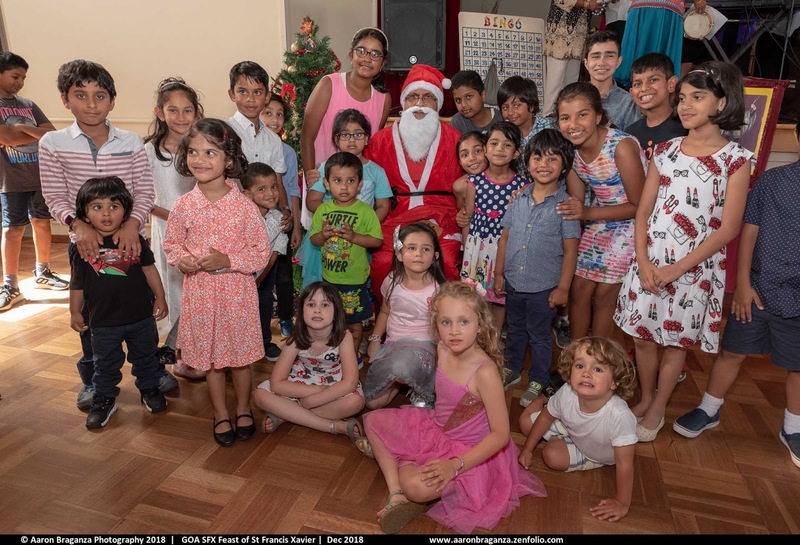 Santa came and kept the children happy, folks sang Christmas carols and other songs, and there were a musician or two and, of course, bingo. It will be interesting to see what Alwyn and his team come up with for World Goa Day next year. I mentioned that it was not perfect, here’s why. I think the seniors’ lunch was introduced during the late George Pereira’s presidency, our young people chauffeured folks who needed transport to and from the feast. 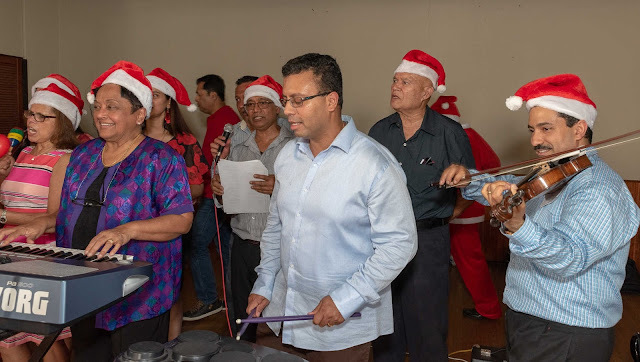 Various members cooked the traditional Goan fare and former President Tony Machado and wife Queenie played hosts. Drinks were also donated, but Harold D’Souza always saved a bottle or two of feni for the feast. Later he and Hazel took up the hosting duties. Right from the very first year of my committee membership (1980 onwards), strict guidelines were drawn up to ensure proper management of elders’ celebrations. Most important of these was that the seniors had to be registered (via telephone call (before the computers) or via member of the committee. Because we were very small community, we entertained non-member seniors. Later when numbers became too large, the invite was restricted to 65+ non-working members. We also entertained visitors on reciprocal basis who were paid up members from other Goan clubs in the diaspora. A letter of introduction from the relevant club was desired, but this was never enforced. Back to the seniors: As the popularity of the lunch grew, so did the enormous problems and embarrassment at the door on each occasion. There was a simple rule, if you did not meet the criteria, especially ringing and booking your spot, you could not be part of the seniors’ lunch. The excuses were inventive, pathetic, sad and the abuse that often followed was uncalled for. I remember a couple claiming that they were visitors when they had been living in Sydney for more than 28 months and were not members either. Or I told a committee member, or I am related to a committee member, or I forgot and remembered only this morning, I am sure I had telephoned and made a booking (of course, he or she could not remember who they spoke to), or I am only working part-time three days a week, or can we sit with our children, or we don’t want to sit with the seniors, we are not pensioners, my partner is sick in hospital can I take a packed lunch for him … There were a lot more inventive attempts to Gatecrash the event but we always stood firm and the gate-crashers eventually evaporated. There were a few people who did not play by the rules and made it tough. Committees cater for people who registered their intent to come. A good friend of mine, who had been overseas, asked me: Why wasn't a place for me at the seniors' table? Did you register? I asked him. Why should I? They know me, he said. A few extras, up to five, are also ordered in case of genuine emergencies but not for people who things for granted or attempt to abuse the system. It is just not fair. 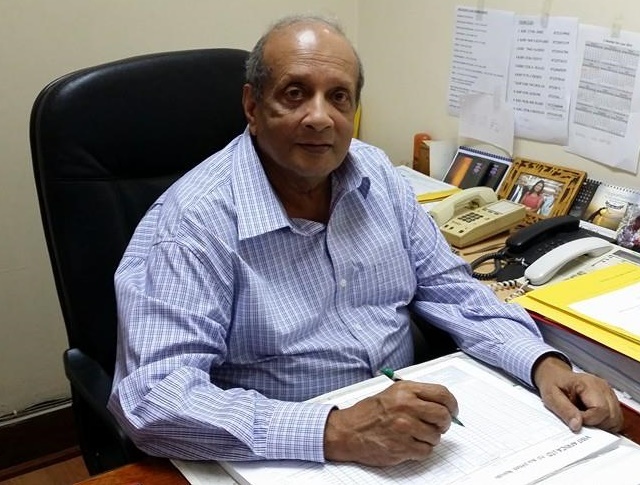 Ralph Vaz, who was standing in Treasurer Abel do Rosario and doing two other jobs, was almost exhausted at the end of the day …7 pm before they left the hall, waiting for the caretaker to come and examine the hall, confirming it had been left in a fit and proper condition. They had received complaints but these were the misdeeds of other folks who had used the hall. I got to say though bar these few, it was a fantastic crowd. Goans love to dance and sadly there wasn’t enough of space. 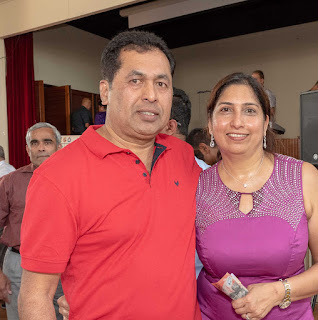 What is even sadder that there are no larger halls available in Sydney to cater for functions like the SFX feast or the World Goa Day. The committee did their best under the circumstances. 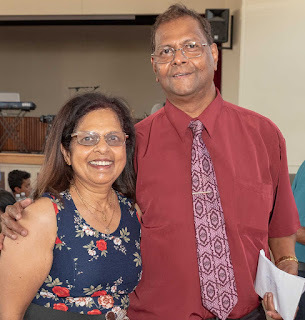 Rachel Menezes(tenor), Norman Menezes, Jason Menezes, Jessica Menezes, Chloe Menezes, Ron Lucas, Helen Lucas, Roy Rosario, Mikalya, Gerry Menezes, Ashley Menezes, Greg Menezes, Angela Menezes, Rosy Andrade, Agnes D'Souza, Alcina D'Souza, Joseph D'Souza. 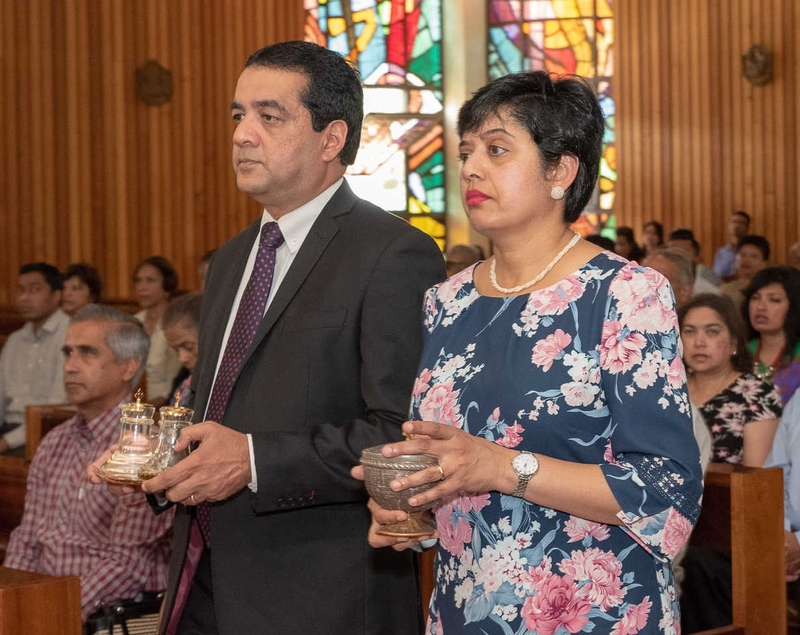 What were hymns, the konkani hymns? Lunch Buffet Management: Alcina, Agnes, Olivia, Audrey & Lata. Goan Sweets: Arranged by Joseph. Kadio Bodio brought by Joseph from Goa. Bathk, Bebinca, Doce made an donated by friends of Joseph. Sweet bowls prepared by Alcina, Agnes, Olivia, Audrey. main celebrant: Rev Fr Vincy D'Costa from Navelim. 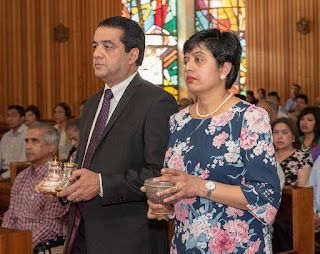 Acolyte: Dr Sanjay Zank, John Fernandes. Entrance Procession: Zachary, Giselle, Arabella, Ariana, Andrea, Stephanie, Jessica, Aureine, Shelly, Sheldon, Carrine. One of thesen days, a professional sound man will help them produce a volume and mix of sound that is pleasing to most ears instead of the cacophony and ear bashing we have to put up with every time. This intolerable noise has stopped some folks from attending GOA functions. But then, again, I am turning into a grumpy old 75-year-old!